Consumer study suggests that more than 15 million UK adults rank being stuck on hold to a telephone operator their top annoyance of 2015. Four in five UK customer care managers believe customers have become more demanding over the past three years. Almost a third of customer care managers believe their biggest weakness is reliance on old customer service techniques. As National Customer Service Week commences today in the UK, new survey results suggest that more than 15 million UK adults rank being stuck on hold with a telephone operator their top annoyance of 2015. [i] The findings correlate with fresh data showing that almost one in three UK customer care managers believe their biggest weakness is reliance on old customer service techniques, including traditional call centres. Commissioned independently byLithium Technologies, a survey of 2,000 UK consumers revealed that almost one in three (29.1%) respondents considered being stuck on telephone-hold their biggest annoyance of 2015, above poor customer service (25.80%), having no Internet (20.10%) and being stuck in traffic (19.80%), among other annoyances. From an industry perspective, almost one in four (23%) UK consumers ranked financial services as the most frustrating sector when it comes to customer service. The same study revealed that the top three factors that drive customer call centre annoyance are communication barriers caused by language differences (56%), having to go through several options and security checks before talking to a real person (48%), and the call centre representative sounding like they’re following a script and not offering personalised advice (37%). The survey highlights the significant amount of time that consumers across the UK are spending on the phone to call centres, and the growing need for financial services companies to explore digital customer service channels. Respondents spoke to call centres, on average, 3.87 times between June and September 2015, with an average call-length of 11.82 minutes. The consumer findings come amidst evidence from UK businesses that customer service expectations are continuing to increase. A survey of 250 UK customer care managers, conducted on behalf of Lithium Technologies, showed that four in five (82.40%) believe customers have become more demanding over the past three years. And more than half of them (56%) suggested that digital will evolve to become a primary customer care channel, minimising response times and better serving consumers. The customer care survey highlighted that while managers believe digital strategies are critical for meeting rising customer expectations, they are under-resourced to take the necessary steps to adapt. The survey found that almost a third (31.20%) of customer care managers believe their biggest weakness is reliance on old customer service techniques, while more than a quarter (27.20%) said their main weakness is underinvesting in a consistent 360-degree customer service experience across all channels. When asked about the future, more than half (56.00%) of customer care managers said that customer service will evolve to focus more on using online channels to minimise response time to queries, while almost a third (29.20%) said customer service will be an entirely online process within five years. Lack of financial resources is restraining digital transformation within many customer service departments. More than six in 10 (62%) customer care managers admitted that having the necessary budget is the main issue their company faces in adapting to digital customer service. 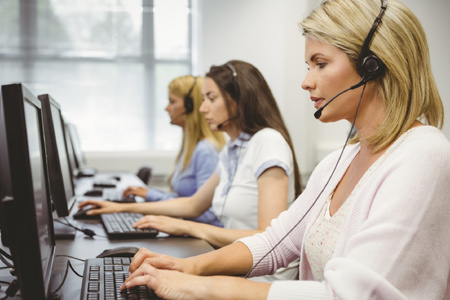 “These statistics paint an alarming picture for UK brands that rely heavily on call centres for customer relationship management (CRM),” said Katy Keim, Chief Marketing Officer of Lithium Technologies.